Palestinian terrorist prisoners are succeeding in smuggling their sperm out of prison, and their wives are then impregnated at clinics in the PA. According to two recent broadcasts on official Palestinian Authority TV, this phenomenon has been going on for a number of years. The Palestinian Prisoners Center for Studies reports that through August 2018, 61 babies had been born from smuggled sperm. Although Palestinian prisoners receive regular family visits, they are not entitled to conjugal visits. Official PA TV host: "Please, do you want to introduce this boy?" 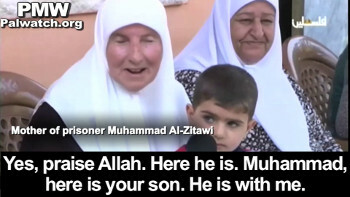 Mother of prisoner Muhammad Al-Zitawi: "This is [Muhammad] Al-Zitawi's son. Talk to him, talk to him." Official PA TV host: "Is he a result of smuggling sperm?" Mother of prisoner Muhammad Al-Zitawi: "Yes, praise Allah. Here he is. Muhammad, here is your son. He is with me." Muhammad Al-Zitawi was deputy commander of the Al-Aqsa Martyrs' Brigades (Fatah's terror wing) in the Tulkarem area and is serving a 25-year sentence. 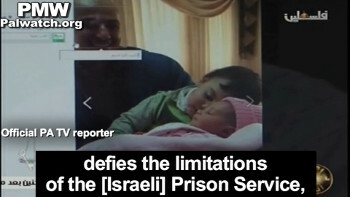 Official PA TV reporter: "In the city of Yatta, we visited the home of the family of prisoner Musa Zayn - who was sentenced to 30 years imprisonment - as his wife has given birth to twins through sperm that was smuggled out of the occupation's prisons." Official PA TV host: "The main topic of this program is 'The children of the sperm,' who are considered a defiance of this oppressive occupation... Our prisoners have decided to be fighters not only in the area of the known struggle, but to defy the occupation through the smuggling of their sperm and the birth of 'the children of freedom'... Let's watch a report on the son of prisoner Ammar Al-Ziben (i.e., responsible for numerous suicide bombings), the first child born from smuggled sperm." Wife of terrorist Al-Ziben: "This is a victory for me, praise Allah, Master of the Universe, that I have a family and I have children who I will educate. Their father will come out [of prison] and be proud of them. This is a victory for us." PA TV reporter: "Salah Al-Din, and his brother Muhannad before him, were born from the same sperm that their father Ammar succeeded in smuggling out of prison years ago, so that impregnation could be carried out afterwards by the Razan [Medical] Center in the Specialized Arab Hospital in Nablus... 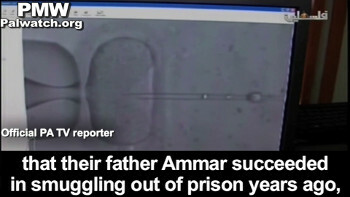 The prisoners' success in smuggling their sperm out from the occupation's prisons defies the limitations of the [Israeli] Prison Service, which prevents the prisoners from having children." 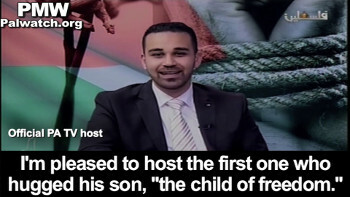 Host: "I'm pleased to host the first one who hugged his son, 'the child of freedom.' He is the released prisoner fighter, one of the giants of endurance, Osama Al-Silawi (i.e., terrorist, responsible for murder of 4). You truly have a rich past of struggle and giving... [Osama] smuggled out sperm and the result of this sperm was [his son] Kamel Al-Silawi." Host: "Doctor, give us statistics on the number of prisoners who have succeeded in having children... How many 'ambassadors of freedom' have been born?" Director of the Razan Medical Center Dr. Salem Abu Khaizaran: "We have 36 male and female a mbassadors of freedom, praise Allah, until now. We also have eight women in different stages of pregnancy. We have dozens of women who, Allah willing, expect to join the in vitro fertilization program soon." Palestinian Media Watch's findings on this subject were presented by PMW Director of Legal Strategies Maurice Hirsch last week to a committee set up in the Israeli Ministry of Internal Security that is examining the prison conditions of the terrorist prisoners. Hirsch also brought up the fact that the PA continues to abuse the goodwill of the International Committee of the Red Cross in order to pay salaries to the terrorist prisoners. Lastly, Hirsch notified the committee that in breach of a decision made by Israel's government and the Head of the Israeli Prisons Service, 1,000 terrorist prisoners are studying for university degrees in prison. Official PA TV host: "The main topic of this program is 'The children of the sperm,' who are considered a defiance of this oppressive occupation... Our prisoners have decided to be fighters not only in the area of the known struggle, but to defy the occupation through the smuggling of their sperm and the birth of 'the children of freedom'... Let's watch a report on the son of prisoner Ammar Al-Ziben (i.e., responsible for numerous suicide bombings), the first child born from smuggled sperm..."
Official PA TV reporter: "Prisoner Ammar Al-Ziben created a spark of hope for his prisoner brothers when he succeeded in smuggling sperm out of prison. His wife then gave birth to her first and second sons." Wife of prisoner Al-Ziben: "This is a victory for me, praise Allah, Master of the Universe, that I have a family and I have children who I will educate. Their father will come out [of prison] and be proud of them. This is a victory for us." Official PA TV reporter: "Salah Al-Din, and his brother Muhannad before him, were born from the same sperm that their father Ammar succeeded in smuggling out of prison years ago, so that impregnation could be carried out afterwards by the Razan [Medical] Center in the Specialized Arab Hospital in Nablus... 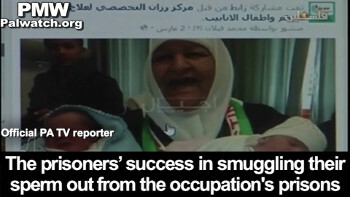 The prisoners' success in smuggling their sperm out from the occupation's prisons defies the limitations of the [Israeli] Prison Service, which prevents the prisoners from having children..."
Doctor, give us statistics on the number of prisoners who have succeeded in having children... How many 'ambassadors of freedom' have been born?" Director of the Razan Medical Center Dr. Salem Abu Khaizaran: "We have 36 male and female ambassadors of freedom, praise Allah, until now. We also have eight women in different stages of pregnancy. We have dozens of women who, Allah willing, expect to join the in vitro fertilization program soon." Ammar Al-Ziben - Palestinian terrorist and Hamas member who was involved in planning suicide bombings, including the double suicide bombing at the Mahane Yehuda outdoor market on July 30, 1997, in which 16 people were murdered. Al-Ziben is serving 32 life sentences. Osama Al-Silawi - Palestinian terrorist involved in the murder of Israeli citizen Motti Biton and in the assault of his wife Molly in October 1992. He also participated in a violent interrogation of Palestinians who were suspected of collaborating with Israel, which resulted in the death of three of them. 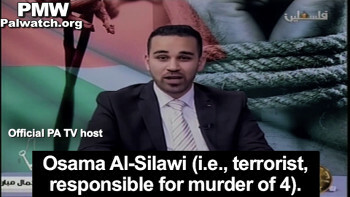 Al-Silawi was serving 4 life sentences and another 55 years but was released in December 2013 as one of 104 terrorists whom Israel agreed to release to fulfill the PA's precondition for renewing negotiations.